"Not Air NZ, not Reflections: Leopard duo"
A treasure from Val's garage sale. I bought two "Leopard" saucers on tm a while back now with the vague hope of finding a cup or two one day, not even knowing what the cup would look like. At Val's today I put this cup back on the shelf thinking I had enough random 783s then it slowly dawned on me: Leopard! Could it be? The various teals and turquoise colours* from Crown Lynn are so different that this perfect colour match shows the pairing to be correct. 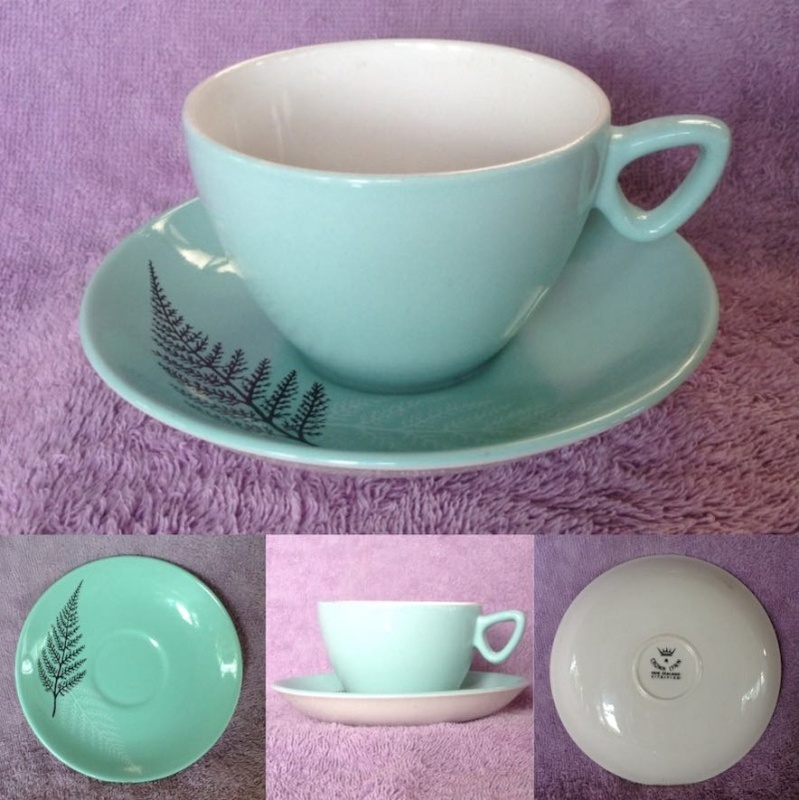 The 783 (Air New Zealand shape) cup is paired here with a 739 saucer. One day, this will display nicely with my Reflections duos. *these include teal vitrified and colour glaze (including Reflections on teal), Air New Zealand, Crown Lynn for Barbaras, Leopard, and various earlier attempts. Stop Press: contrary to my last remark but consistent with Val's opinion in the Leopard link I believe now that this is the same colour as Air NZ DC8. I have a lugged soup bowl that I thought was Air NZ without Tahora pattern but now I believe it to be Leopard. 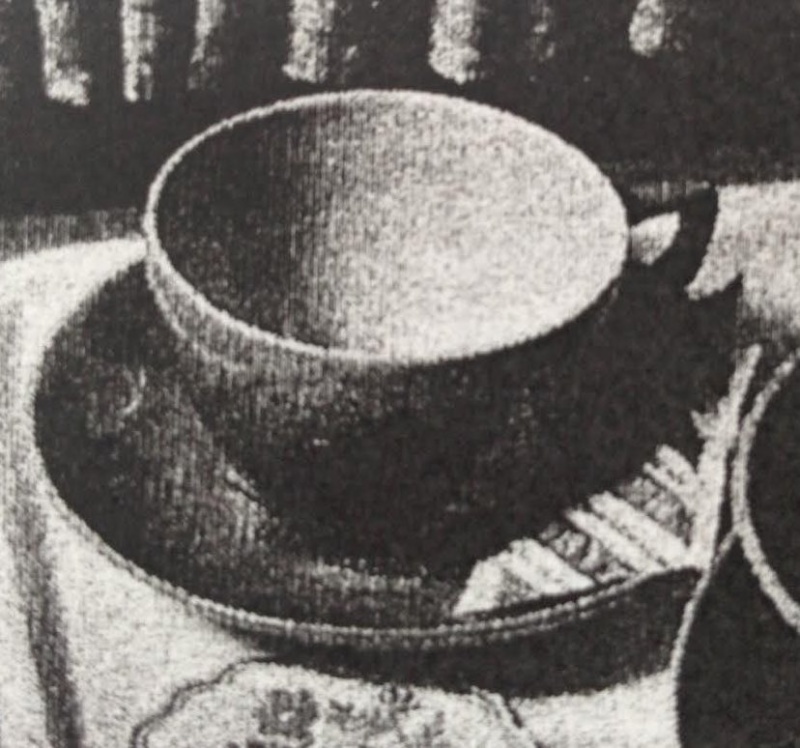 As this particular "upright", the cup, is without transfer it is reasonable to expect that other uprights also lack transfer, and as the colour glaze on the soup bowl is on the outside rather than the inside it could thus be deemed an upright. That is consistent with Tango lugged bowls (red and blue) but obviously not with Air NZ DC8. I have seen other wares advertised on tm as Air NZ without the transfer: likely Leopard! I have to retract that last statement, now that I've found the photo showing the ferns vitrified ware ..... I should have checked it out before jumping in !!! Well, I was right in the first instance, when I expected that the correct cup would be a 755! Thanks for pic Ev. I'll watch for one of those now. So, either this 783 cup is a later match or an Air New Zealand without its Tahora transfer. Definitely a colour match. I think that saucer looks so prefect with my cup. What a pity they are not a match! 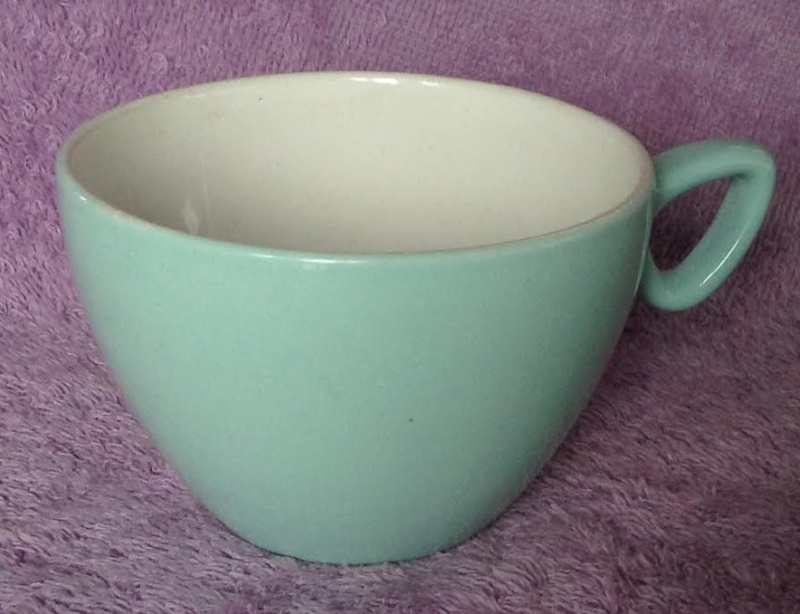 I too have plain cup like yours Jeremy, Its a different shade of teal, than most. I thought it went with the Trillo's downtown series as an old ad in the newspaper said it was matched with various colours. Although the pattern book originally said Black cup 3622; later they brought out 4 colours Sun gold, Teal, Oyster and Bronze in the same shape as your teal cup. As I continue my exploration of Crown Lynn's Reflections pattern, it's variants, and associated patterns I see that I have a new goal. The design that Ottway Josling produced was on a blue background, the first Relections in production was on teal and the commercial wares that Crown Lynn produced from the late 1960s and through the 1970s were mushroom. Only teal pat.no. 755 and mushroom d842 Reflections have been seen here. I believe I have all cup and saucer combinations for the latter with the exception of the hotel stacking shapes (3624/4624). When I started writing this there was a dinner set for sale with six settings including the stacking shapes. The Reflections on Teal pattern appears on dinnerware including a tulip duo (781/805) of which I now have a set of six, but they are scattered around the place atm. 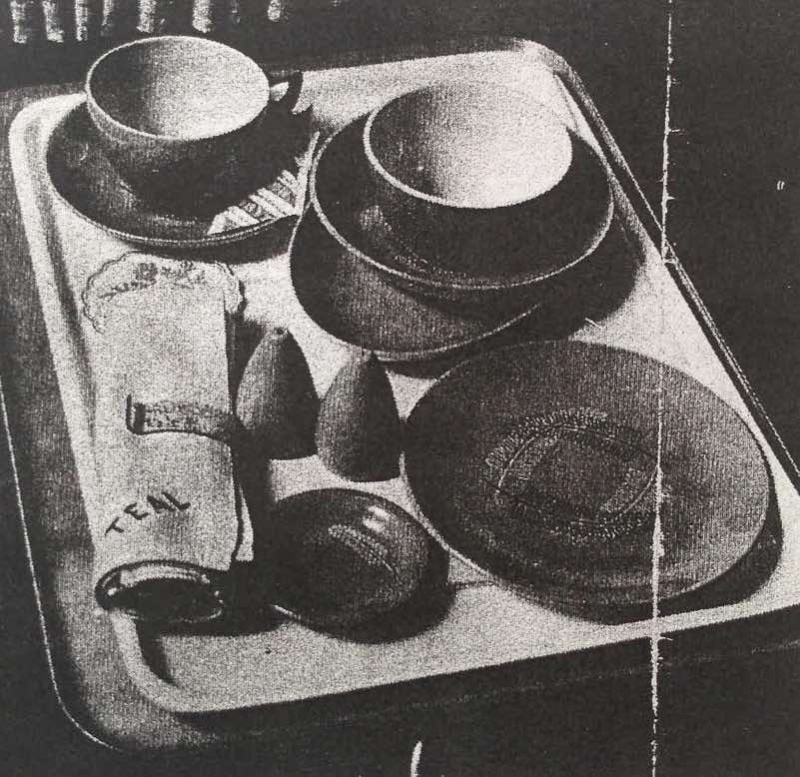 These cups and saucers are earthenware and have Reflections backstamps. But I think I am still missing something. It has always troubled me that Reflections was chosen by TEAL, NZ's international airline, yet the Reflections on Teal I have is earthenware and I would expect china for commercial use to be vitrified. 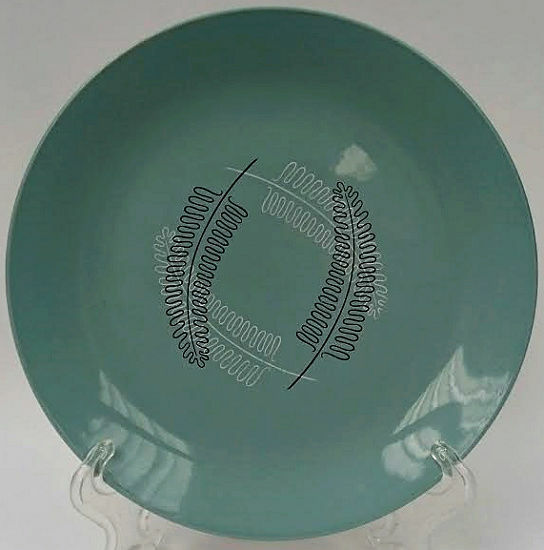 I now find in Ceramics New Zealand that the wares CL produced for TEAL were indeed both "teal blue" in colour, and vitrified, and rather than a Reflections backstamp theirs were specially made for TEAL. I have a photo of such a stamp which has likely come from a trademe listing. Note that the Reflections transfers are on the flats, ie the saucer, so the uprights, the cup etc, will be plain teal colour. The Easter 1964 Ceramics shows the 783 shape was used for the design competition that year, which is consistent. So, yet another Reflections duo to find. Was Reflections for TEAL in the Reflections on Teal teal blue, or the distinctive teal blue used by Air New Zealand and later, perhaps, by Leopard Breweries. If the latter, then perhaps the unmarked 783 I got from Val, expecting it to be a Leopard cup (which we now know is a 755 shape) is actually a TEAL cup? Reflections for TEAL 783 ??? The TEAL Reflections would have been used only for a short time, a year or so, because the company changed its name to Air New Zealand in 1965, and the Tahora-patterned DC8 ware marked Air New Zealand came into use that year. The same story could explain the soup bowl without Tahora, note however that the soup bowl in the Crown Lynn photo is not one with lugs. Supposing that my 783 is indeed Reflections for TEAL, then the plain cup will be accompanied by a (transfer) patterned saucer. 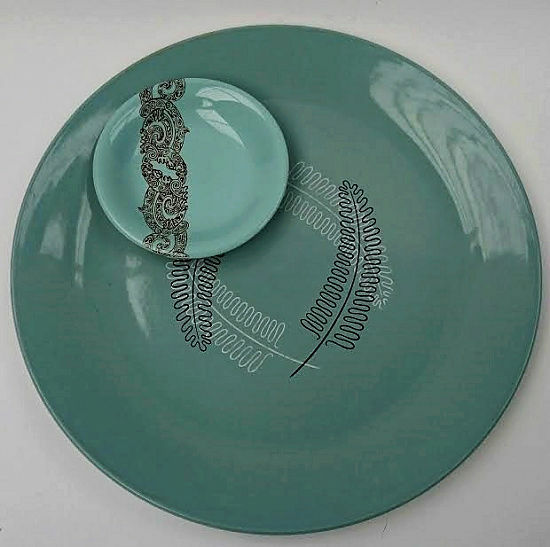 So, I'm looking for vitrified dinnerware with Reflections patterned flats and plain (Air New Zealand colour) teal uprights. And, Ev and Janice, this must surely be a different deco number if it has a different base colour from Reflections on teal pat 755. 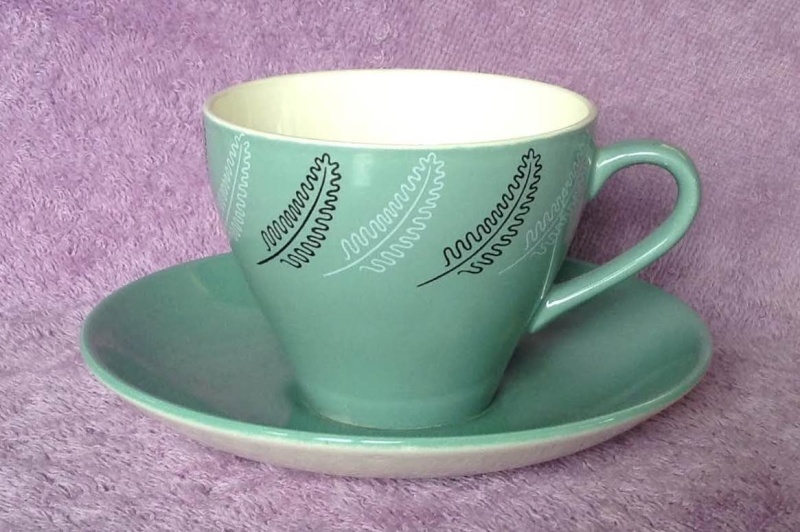 In the ceramics write up that goes with the photo, it says Crown lynn made special TEAL backstamp (vit) & that the first cups and saucers to be Vit Brown and then 4 new fashion colour cups in EW . So the plot thickens !! 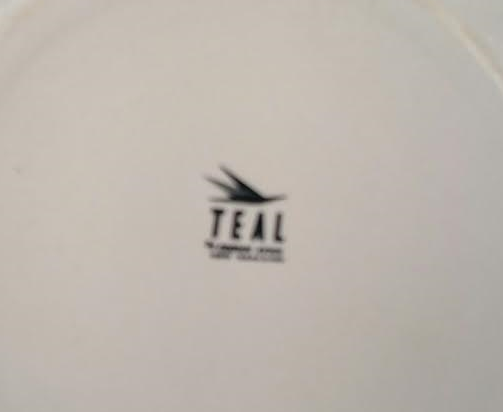 Here's the TEAL backstamp. The trademe user hpmjlp is no longer on record so I am unable to ask permission to use it. why do you need to ask for permission? Its public domain and Crown Lynn did not copyright their designs or back-stamps. The Trade me person certainly has no rights to the back-stamp. Dale, the copyright belongs to the photographer. doubt it in these cases. could fall under "fair use" and/or "derivative work". I agree, something like that. I have credited it and attempted to identify the owner. If Ev chose to put it in the gallery until something else came along it would have to be credited to "hpmjlp from trademe", not me. Thanks for posting the link Ev. I was aware of the image but had not referred back to it for this discussion. I had forgotten that it had the 783 cup. That gives us pattern number 796 for TEAL Reflections. Unfortunately for me, wrt the cup, it places transfers on the uprights. ... which still leaves me with no pattern for my 783 cup! On another matter, it gives us the 739 saucer for the 783 cup. The saucer for my 783 Red Tango is NOT a shape match for my other 739s. I do not have an Air NZ Tahora duo so I cannot say what saucer that has. I have not yet found colour info on that drawing so will post the whole tm pic that I got the TEAL stamp from. It is hard to pick from the image which teal colour was used. Dale Ritter wrote: doubt it in these cases. Hi Dale, on this site we respect the Copyright rules, which are that any text or images are the property of the person who wrote them or took the photos and permission of the copyright holder is required to use them and they must be acknowledged when using their work. A link is the easiest way around this and doesn't break any rules. Both the Auckland Museum and the Portage Museum hold a lot of Crown Lynn records and photos and they have Copyrights regarding this material. We were granted permission to use the Crown Lynn photos of Shapes in the records from both of these Museums for our Gallery Catalogues and we have acknowledged them for each photo. They are only to be used until we can replace them with photos of our own. All of the photos in the Galleries have the copyright holder acknowledged. 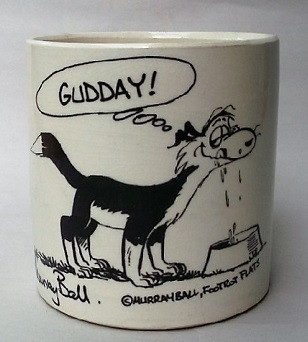 Any photos that are added to this site can be used to show the big pottery picture, which we are more than happy to do. This link shows that the pattern is called Reflections d796. I will add Teal Airlines in front for the gallery. 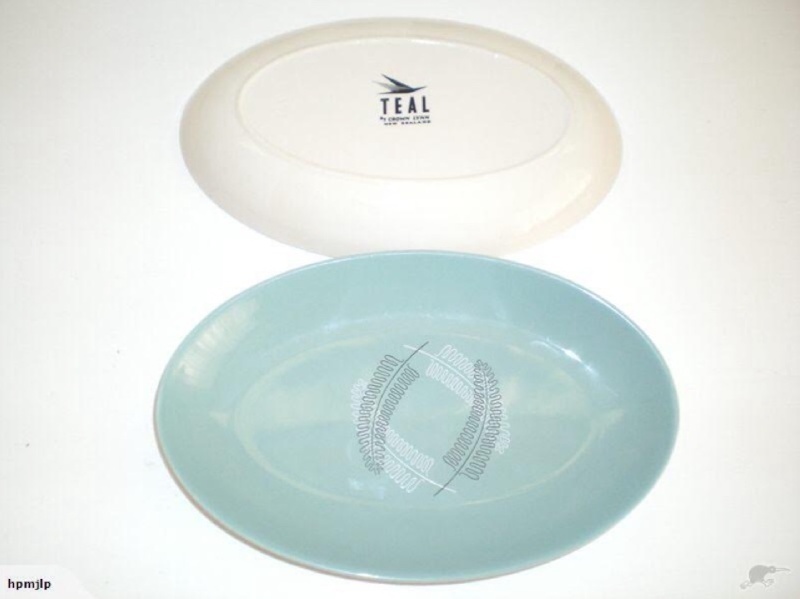 I have a Reflections Teal Airlines plate and it should be a shape 864/8 which is the lightweight hotel ware which we don't have in the Gallery. However it is 8 3/8ths and that creates a dilemma. The colour is hard to capture on digital, but it's quite green compared to the Air New Zealand Tahora ware.